Outstanding job on your offensive efficiency rankings, but you didn’t mention the quality of defense faced by each team. Surely a team which faces soft defenses is going to appear to be more efficient than one who plays the Ravens, Steelers etc? It’s a good observation. The quality of defense a team faces definitely has an effect on offensive production. The next series of posts I do will be on a corresponding defensive efficiency ranking (called, unsurprisingly, “D-SCORE”). I thought it would be more useful to get the defensive piece of the puzzle out of the way before adjusting O-SCORE to reflect opponent defensive quality. I suspect though, that in most cases there will be only a modest-to-small impact over the course of a season. It’s very rare for a team to play more than 3-4 really good or really bad defenses. Because football sample sizes are so small, and each sample has a ton of variables for which stats can’t account, I’ve found that it’s often better to take a slightly broader view of things than you would with other sports. Sometimes mincing things too finely can skew your data more than if you had gone with a broader-than-ideal way of looking at things. That said, it’s definitely something that I’ll be looking into and presenting for discussion. During a Wisconsin game, the announcers were making the case that Russell Wilson’s height shouldn’t be an issue because he plays behind an “NFL sized” OL already….thoughts? – I think we can assume that NFL DL and LB are better than their college counterparts. Furthermore, they’re usually the best physical specimens in the country. The biggest guys who can run the fastest, or the most agile 350 lbs guys, or the guys with the longest and strongest arms. These guys can tip passes and disrupt QB’s far better than college players. The taller a QB, the easier it is for him to get the ball over the line and avoid tips (unless he has a funky delivery/release point). – Along the same lines, Wilson is protected by a very good Wisconsin OL which is better relative to their opponents DL than most pro OL’s. In other words, unless Wilson is playing behind a top 5 NFL OL, he is going to be challenged significantly. Combined with the “bigger, faster” point, he is unlikely to have the kind of time in the pocket he enjoys now. And when he had less time, at N.C. State, he looked like a guy who was just another short college QB with very limited pro potential. – It’s not just height, it’s overall size. Wilson makes a fair number of plays with his legs, and chances are he’d have to make more in the pros because defenses are better and his OL will (most likely) be worse relative to his opponent’s DL. While he’s RB sized (5’11, 210), as a QB he can’t afford to take the beating a RB would and still remain effective. How many times have we seen a “mobile” QB who becomes less effective after taking a bunch of hits? I’m not saying Wilson couldn’t take the pounding, but it’s certainly something to consider for any QB who relies on extending plays with his legs. Furthermore, I’m not sure Wilson is athletic enough to have a ton of success extending plays in the NFL (again, NFL players are faster and bigger and Wilson isn’t Michael Vick in terms of athletic ability). – For all the talk about Drew Brees, people forget that Brees has a somewhat unusually high release point. I’m guessing he developed that somewhere along the line to compensate for his height. Wilson is not only shorter, but releases the ball lower which could present problems for him. I don’t like to categorically dismiss players based on one physical attribute, so I’m not going to say Wilson will definitely flop in the NFL. But the track record for short QB’s is abysmal for a reason. So while Wilson has shown he can succeed behind a “big” OL, I’m not sure that means he can succeed behind the average NFL line. Much of his success comes from him being able to compensate for his small stature because the Wisconsin OL is bigger and better than their opponents. When his line breaks down, he can outrun many of his pursuers to make a play out of the pocket. I don’t foresee him having that type of advantage in the pros, which to me is a much bigger concern than the height of his OL. – Turnovers: It seems like common sense that a team that turns the ball over a lot is unlikely to score a lot of points – but that’s not necessarily the case. 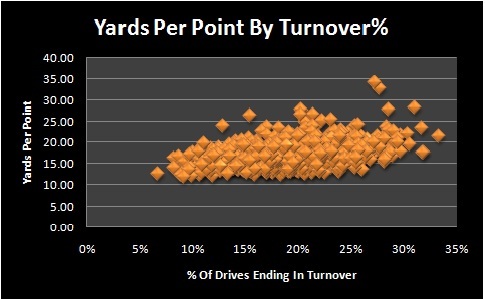 In fact, a team’s turnover rate is only very weakly linked to their points scoring. The 1977 Cleveland Browns, 2001 St. Louis Rams and 1993 Houston Oilers all had offenses which scored 10%+ more than league average but are all bottom 2o (since 1970) teams in turnover ratio. However, of the 50 teams which turned the ball over the least, only 5 had worse-than-average scoring offenses (measured by points per drive). The conclusion here seems to be that great scoring offenses who turn the ball over a lot aren’t hurt too much since they are so efficient at turning their other drives into points. Offenses which turn the ball over a lot tend to be mediocre or worse at scoring points, but some of that is probably due to a lack of talent. After all, how many great QB’s turn the ball over a ton? How many high-quality RB’s fumble a lot? A few, for sure. But in general, elite scoring offenses are laden with elite talent – the type of which doesn’t turn the ball over and can overcome the mistakes they do make. The negatives effects of offensive turnovers are more likely to appear in their team’s defensive stats. 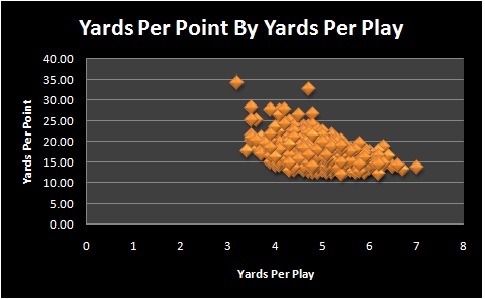 – Yards Per Drive: Again, the takeaway point here is that great scoring offenses generate a lot of yards per drive. Teams who have high points-per-game or points-per-drive tend to have high TD%. Because TD drives are (usually) longer than drives which end in field goals or punts, a high YPD is very common amongst high TD% teams. Since 1970, there have been 571 offenses which have been below-average in terms of YPD. Of those, only a mere 83 (14.5%) put up a PPD better than league average. 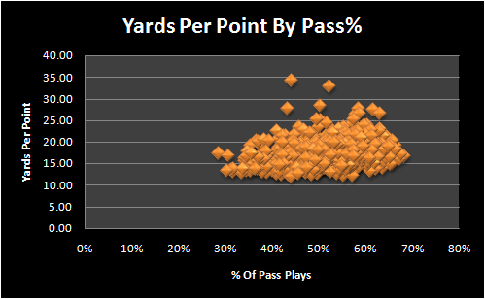 -TD% – A variable which is closely tied to Points Per Drive. 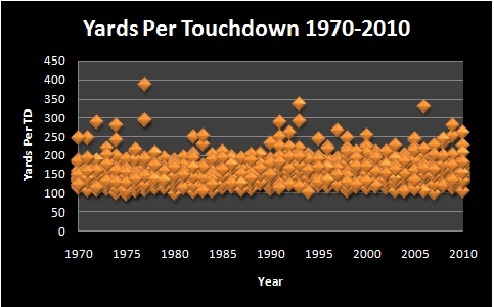 Touchdown drives maximize the number of points your team scores (i.e. it’s unlikely you will be outscored in a game if you score a TD on every drive, assuming a PAT conversion, your opponent would either need an extra drive or to make a 2 point conversion). Furthermore, drives which end in TD’s obviously cannot end in turnovers or punts – both of which can lead to an opponent scoring a non-offensive TD. 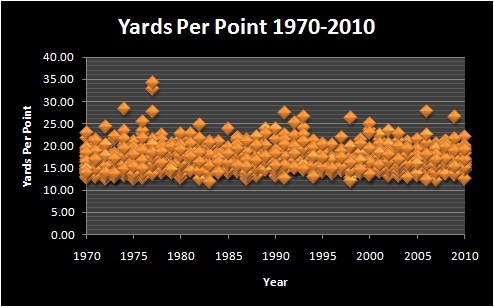 – Yards Per Point – At the risk of sounding redundant, great scoring offenses almost always have high YPP rankings. 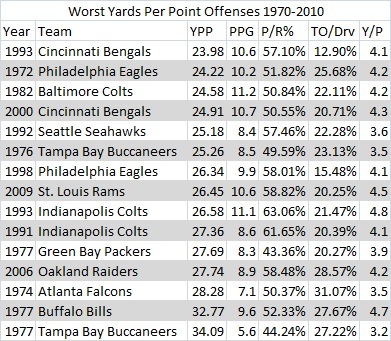 However, there is a large “middle class” of YPP offenses which under-perform their expected PPD ranking. This could be due to a number of variables (shaky field goal kicker, red zone troubles, turnovers, etc). 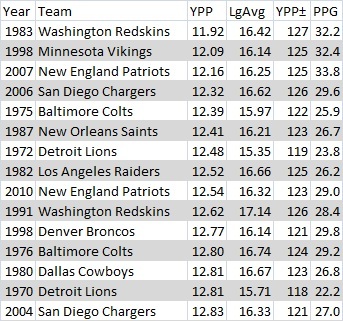 It’s rare for a below average YPP offense to have an above average PPD (about 15%). This stat can be skewed a little by a team having an elite defense or special teams – creating an unusually high number of short fields for the offense. All variables were taken as a percentage of league average. 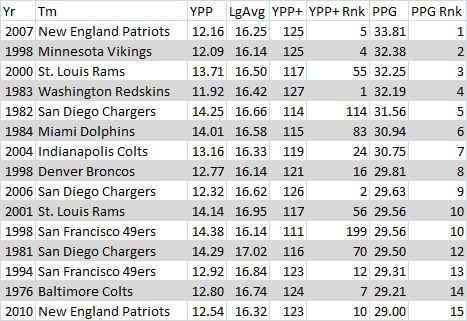 For example the 2007 New England Patriots had a YPD of 43.58, which was 40% better than league average. So for my rankings, I assigned them a YPD value of 45. The 2007 San Francisco 49ers had a YPD of 20.98, 33% worse than league average, so they get a value of -33. The coefficients by which I weighted each variable were determined largely by a series of linear regression models. If you’re unfamiliar with regression analysis, it’s a way of mathematically determining the effect a variety of different variables have on another variable. The goal was to determine which offense gave their team the best overall chance to win, assuming a league average defense. Because the math is as boring as it is complicated for most, I’ll skip it for now (and revisit it perhaps in a future post for the math geeks out there). The other, smaller, part of the coefficients is much less scientific. There’s a point to which stats unfortunately can’t explain everything. There’s simply no way to know how many times a drive which ends in a turnover would have otherwise ended in a score. Furthermore, there is very limited data (in terms of years) available on things like points of turnovers and red zone scoring %. There’s also stuff which isn’t reflected in stats, such as “can this offense effectively run out the clock when they’re winning, even if they’re not a high-scoring team” (YPD is probably the closest we can come to figuring that out statistically). To this end, I put a little additional weight on TO% and YPD and a little less weight on TD% (which is partially overlapped by PPD anyway). 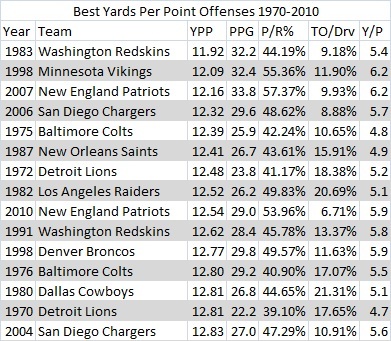 On average, a team scores one offensive TD for every ~150 yards of offense it generates. 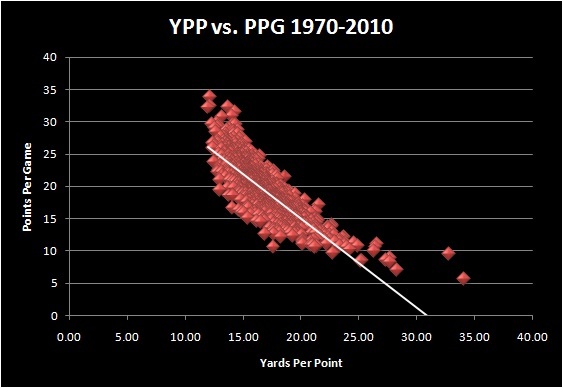 There’s also not much of a correlation between a team’s YPP efficiency and their turnover ratio. Through this series, we’ve seen a number of different ways to evaluate an offense’s efficiency. Each of them is a piece of the puzzle; the final part of this series will bring all these pieces together into a single metric by which to measure offensive efficiency.